Shankaracharya Temple is said to be constructed around 200 BC by Jaluka, who was the son of Emperor Ashoka. 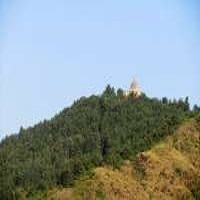 It is located on the top of Shankaracharya Hill, known as Takht-e-Sulaiman, which is around 1,100 ft above the main city. From the top of this hill, visitors can have a beautiful view of the snow covered mountains of Pir Panjal mountain range. The temple is constructed on an elevated octagonal plane, which can be easily reached by steps. Tourists can also witness a modern ceiling and Persian inscriptions inside the main temple.